Our performance DC Brush Starter Generator line was designed for starting of all types of turbine engines and auxiliary power units (APUs) and is used as an engine drive source of DC power rated up to 400A continuous duty. We are the aerospace industry leaders in brush and bearing life delivering our customers greater reliability and reduced overall cost of ownership, especially when paired with our durable, lightweight Generator Control Units (CGU). Additionally, our excellent low speed performance results in reduced fuel and maintenance costs. 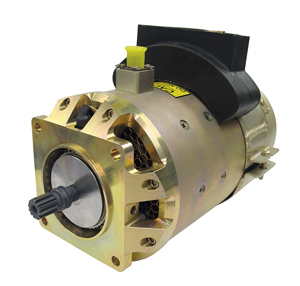 Contact us today to learn more about our extensive catalog of DC Brush starter generator units (SGU) available in multiple sizes and speeds to fit almost every application. Watch Blackhawk Modifications on aircraft comparison of our 325 Amp Starter Generator with an original unit!